With help from the 2016 BioTreks Production Team. Kevlar has proven to be an innovative product for many reasons, especially in the textile industry; however, the need for a natural alternative to a strong fiber still exists. A well-known high tensile strength fiber that can be considered is spider silk protein, which served as our model for genetic studies. Spider silk has the characteristics that enable it to be one of the most versatile materials used. By finding a method of synthesizing spider silk, we would enable its use to be widely adopted as a commercial product. This will be vital to the progression of the spider silk industry due to the challenges of producing spider silk via spider domestication. The primary objective of our study is to design a functional spider silk operon to later be used to synthesize fluorescent silk. In order to design the spider silk operon, we first determined the genetic sequence that creates the spider silk protein. We then created a recombinant bacteria with the operon and synthesized an operon with three repetitions of the spider silk gene, which would allow for future proteins to contain the proper construct. After the initial coding, we realized that due to the similarity in the gene sequence, the operon could not be synthesized commercially. Therefore, we had to recode the entire gene again. Unfortunately, after conducting polymerase chain reaction and electrophoresis, the fragment length could not be verified, which will be a source of continual investigation. Upon receiving the commercially produced gene, we will run polymerase chain reaction, duplicating the gene to use in a plasmid vector. Once transformation is complete, we will run DNA electrophoresis to guarantee the correct operon sequence was formed, allowing us to begin the process of extracting and purifying the spider silk protein and engineer a spinning apparatus for commercial applications. Authors are listed in alphabetical order. Mark Trice mentored the group. Please direct all correspondence to mark.trice@fcps.org. This is an Open Access article, which was copyrighted by the authors and published by BioTreks in 2016. It is distributed under the terms of the Creative Commons Attribution License, which permits non-commercial re-use, distribution, and reproduction in any medium, provided the original work is properly cited. Police, fire and rescue services, the National Guard, and many other law enforcement and life saving agencies are constantly searching for superior equipment. The idea behind the Frederick High iGEM team’s project is to design and produce synthetic spider silk that will present fluorescent qualities. With a tensile strength of between 1,100-2,900 MPa occurring in natural spider silk as compared to the average of 2,600-4,100 MPa in kevlar vests, lab-engineered spider silk may easily surpass Kevlar vests within years of synthetic silk development (Kraig Biocraft Laboratories 2008). The strength presented by spider silk is very promising in the way of future bulletproof and fire retardant textiles. The fluorescent quality is derived from our projected insertion of the Green Fluorescent Protein (GFP) gene into the genetic sequence of the spider silk, which is intended to increase the visibility of spider silk garments in cases of emergency where such visibility would be helpful. We began by re-culturing the light-oxygen-voltage-sensing (LOV) gene, a gene that senses environmental conditions to initiate multiple biological functions in plants, fungi, and bacteria. Previously synthesized by the 2012 FHS iGEM team, the LOV gene would function as an initiator of GFP expression within our operon. The GFP protein will express itself with the help of the LOV domain gene, which will be inserted with our transformed bacteria’s GFP/silk sequence. LOV is present in numerous plants, fungi, and bacteria and is utilized by these organisms to ensure control and adjustment of circadian rhythms as the seasons and environment of the organism change (Edmunds 1988). The gene will act in tandem with the GFP protein as it senses light and will increase or decrease GFP expression accordingly. Currently, we are hoping to overcome difficulties in the production of our genetic sequence for the spider silk and to devise feasible plans for spinning techniques once we have successfully synthesized the silk proteins. If our project is successful, it will not only provide students with the hope and inspiration to continue groundbreaking research that can benefit society but it will also produce more opportunities for large scale operations in the textile industry. Regrowing and Re-Plating the LOV Gene. Materials necessary to re-plate the Escherichia coli bacteria with the LOV include the samples themselves that were created by the 2014 FHS iGEM team, in addition to Luria-Bertani (LB) agar plates, nutrient broth, chloramphenicol (50 mg/mL), inoculation loops, test tubes, sterile L-shaped spreaders, and labels. A frozen bacterial culture containing the LOV gene was thawed to room temperature. 5 mL of nutrient broth was then added to a 15 mL conical tube and incubated at 37°C for 24 h. After the incubation period, 100 µL of nutrient broth was added to the center of five nutrient broth agar plates without spreading the liquid. To each plate, 20 µL of 50 mg/mL chloramphenicol was added to each drop of 100 µL nutrient broth on the plates. Using an L-shape sterile spreader, the liquid was spread across the surface of the plate and undisturbed for 10 min. To allow the liquid to soak into the plates. 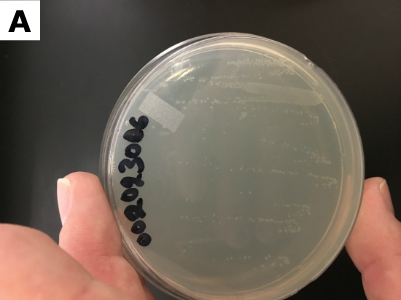 Using the refrigerated (or thawed) reagents, a sterile inoculating loop for each sample was dipped into one of the five cultures and spread on the corresponding labeled plate using the four-quadrant streak. Incubation of plates occurred at 35°C overnight, and then the colonies were refrigerated until viewing. Confirming the LOV Plasmid is Present in E. coli Colonies. To confirm that the E. coli we plated on nutrient agar with chloramphenicol actually contained the LOV plasmid, a polymerase chain reaction (PCR) assay was performed. Individual colonies were chosen and re-suspended in 200 µL nutrient broth by vortexing. A 10 µM working stock of the VF2 BioBrick primer was prepared by adding 10 µL 100 µM VF2 to 90 µL nuclease-free water and vortexing. A subsequent 10 µM working stock of the VR BioBrick primer was prepared by adding 10 µL 100 µM VR to 90 µL nuclease-free water and vortexing. A 1 µL aliquot of each colony suspension (prepared above) was added to a PCR mix instead of the DNA template. The PCR protocol was carried about using the High Fidelity Mastermix from New England Biolabs. A standard PCR protocol was followed (as outlined below). However, the initial PCR step was set to hold at 95°C for 10 min. This will disrupt the cells and release the DNA. Additionally, the PCR annealing temperature was modified to 66°C. Our PCR cycling conditions consisted of 30 s at 98°C,10 s at 98°C, 20 s at a temperature determined by the NEB Tm Calculator (in our case, we held it at 66°C), and repeated 35 times from step 2, 120 s at 72°C, indefinitely 10°C. Visualization of Gel. We used the FlashGel System from Lonza (Basel, Switzerland) to visualize our electrophoresis gel products. Using the FlashGel System, 4 µL of each PCR product was viewed and photographed per the manufacturer’s protocol. If the LOV plasmid is present in the sampled colonies, defined bands would be easily visible on the gel. Afterwards, the colony suspensions and primer working stocks prepared above were carefully labeled and stored at 4°C (bacteria) and -20°C (primers) for future use. Creating and Commercially Synthesizing the Sequence. Using a traditional codon chart provided by Dr. Rozak and the original spider silk protein sequence, our team was able to re-code the gene so that it would be reproducible in commercial environments. Using the computer software program Google Sheets, the genetic code was set up, and each codon was systematically re-coded by adjusting the third nucleotide so that there would be variety in the sequence while still coding for the same proteins. Safety. Throughout our experimentation and various labs, proper safety methods were utilized by using safety gear and safe procedures. Every student was trained in the use and care of all tools used, preventing any damage to the materials or the students themselves. Routine checks were completed on eyewash stations and chemical showers to ensure proper functionality. Disposable gloves and goggles were worn when handling any of the lab materials, as well as using non-virulent strains of E. coli provided to us by the previous iGEM club. To eliminate any contamination issues, all lab surfaces were cleaned with Q18 disinfectant, and Clorox wipes were utilized for some surfaces used in the lab that would’ve come in direct contact with lab equipment. All labs were overseen by our mentor Mark Trice as well as occasionally our associate Dr. David Rozak, and all lab designs were finalized by the both of them to prevent any faulty procedures. Thermocycler and vortex training were completed so that neither would be damaged nor cause any injury. The plates in Figure 1 show the growth of our successfully transformed E. coli bacteria. These exhibited growth due to the intake of the plasmid that contained the LOV gene. 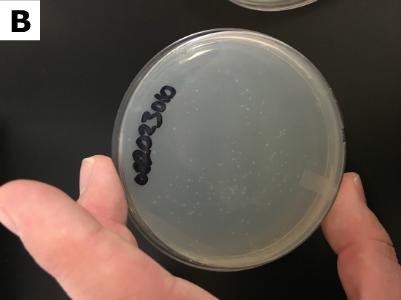 These E. coli were successfully transformed through the use of a plasmid that used chloramphenicol as a selective growth agent to allow only those transformed bacteria to propagate. We first combined the plasmid with E. coli DNA then used PCR to create more of this recombinant DNA. 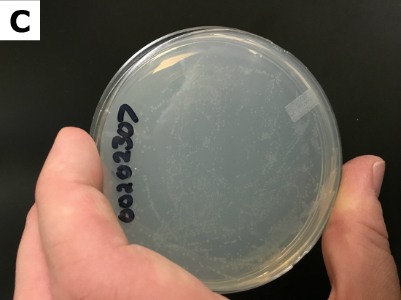 This led to the successful growth of colonies seen on these plates. Figure 1. Panels A, B, and C are all plates of E. coli colonies that were transformed to contain the light-oxygen-voltage-sensing (LOV) gene. Each is a frame of different plates that contained the same bacteria. This displays the successful growth of transformed E. coli. Figure 2 shows the two rounds of DNA gel electrophoresis that we ran after transformation. This allowed for greater DNA analysis and also for a check point in our lab that enabled us to verify whether the plasmid is actually present. Figure 2A was the initial test, and Figure 2B was the secondary test done at a later time. Figure 2. 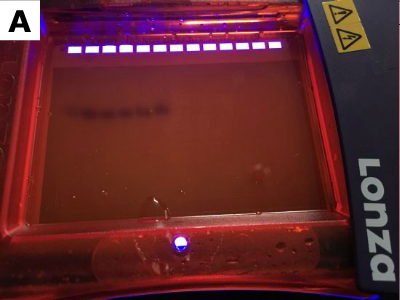 Panel A displays the initial gel electrophoresis and also shows the failure of the band to separate, leading to difficult analysis. Lane 1 was filled with a 100 bp standard that shows the different band sizes. Lanes 2-5 were filled with polymerase chain reaction (PCR) product from the bacterial DNA that were supposed to have the gene. Panel B shows the FlashGel, which failed to separate the DNA during the second attempt. We had redesigned the spider operon in order to increase the probability of transformation once receiving the commercially synthesized product. By selecting codons that were more probable to work, we were able to create a more efficient and successful operon that we would be able to use in the further progression of this project. As to be expected with any experimental design, our work towards assembling the spider silk gene led to many complications. However, these complications were only minor, and we were still able to gain the necessary parts to assemble our operon in future labs. 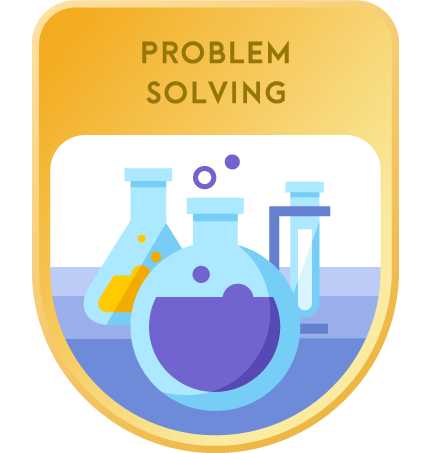 As with most experiments, we experienced many issues with our project that prevented us from forming further results. 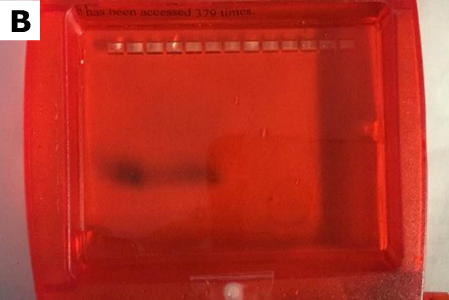 We were able to plate and grow transformed bacteria using the LOV gene; however, when using gel electrophoresis to test for the transformation, the results (as seen in Figure 2) were inconclusive, and we could not guarantee the transformation. What we were able to accomplish was the design and coding of our proposed operon for fluorescent spider silk protein. With the help of Dr. Rozak, we were able to assemble a working code for high-tensile strength spider silk protein. Using the gene presented by the 2012 Utah State team’s Biobrick (Arachnicoli d.t), we decided on having the gene for spider silk repeat three times within the operon, allowing for a higher tensile strength when the protein is formed into silk. Then, the promoter, ribosome binding site (RBS), and start codon were coded and placed at the beginning of the appropriate gene sequence to allow for the proper replication of the spider silk gene to occur when it is transformed into the appropriate bacteria. Afterwards, two stop codons and two terminators were joined to the end of the code. Due to the repetition of the spider silk gene within the operon, Integrated DNA Technologies’ (IDT) gBlock program did not accept the design we produced. Therefore, we had to go back into the template and re-code the various amino acids so that the similarities between the three repeating genes could be increased. This allowed us to resubmit the operon design with what we thought was enough differences in the replicated gene for the gBlock program. The DNA most likely did not separate due to the failure of restriction enzymes to properly cut the DNA or the plasmid breaking the area where the restriction enzyme cuts. Another possible source of error could be receiving a “false positive” transformed bacteria where the LOV gene was not actually present in these colonies. A third possibility may be that the primers did not anneal during the PCR process. To resubmit our design, we also had to break the operon down into three functional parts that could be assembled post-creation. Part 1 consisted of the promoter, RBS, start codon, and one silk domain; Part 2 consisted of a silk domain by itself; and Part 3 consisted of a silk domain followed by two stop codons and two terminators. This also helped prevent any errors in coding due to the three spider silk codons being separate on the lengths of DNA and being later joined together in the correct sequence. Overall, we had many complications throughout our design of a fluorescent spider silk gene and will be continuing this research into next year. However, we now have a functional design for a spider silk operon used to produce the spider silk protein. In the future, we hope to have the physical operon that we could then verify through the use of gel electrophoresis, ensuring that we have the correct length for the operon. We would then perform a vector ligation by inserting the plasmid into a viable vector. This will then be transformed and the successful ligation will be verified by performing a restriction digest, which should show us both the vector and the insert dropping out under it. Once verified, we would grow bacteria that would be able to produce this protein and eventually synthesize physical spider silk that glows in the dark through the use of a spindle mechanism. 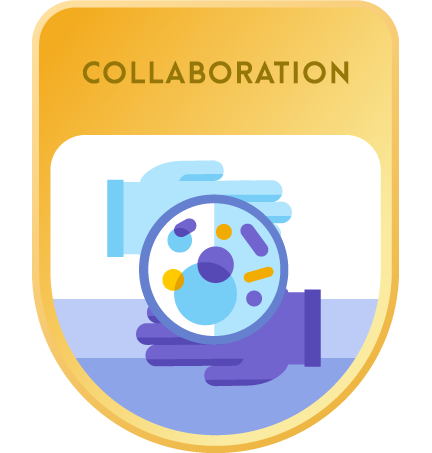 We would like to thank the following individuals and companies that have helped bring this project to fruition: Principle Kathy Campagnoli and Frederick High School, David Rozak and Ars Biotechnica, Laura Dress and Breezio, the 2012 Utah State University iGEM Team, Adil Zuber, and New England Biolabs. Thank you! All articles in this issue of BioTreks were published with support from Genome Alberta and Clinical Research Management. Edmunds LN. Biochemical and Molecular Models for Circadian Clocks. Cellular and Molecular Bases of Biological Clocks. New York: Springer-Verlager;1988. 497 p.
Spider Silk. Kraig Biocraft Laboratories [Internet]. 2008 [cited 2016 May 19]. Available from: http://bit.ly/2dghNTb.